‘Shearmyste’ is a Laurent Giles 55ft aluminium ketch built to a Laurent Giles design by Thrislington, Newton Aycliffe and launched in 1984. She was originally designed as a pilot ketch but has since been modified to remove the second (internal) helming station. She completed the ARC in 1992. 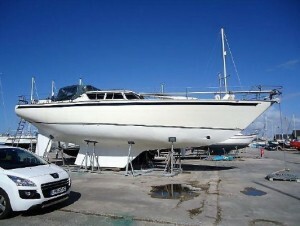 Accommodation for 6 is provided within 3 cabins on board this Laurent Giles 55. The master cabin to aft features a large double berth with excellent storage in wardrobes, drawers and cupboards. The master cabin also benefits from a private en suite bathroom. The forecabin also features a large double berth and plentiful storage wardrobes and cupboards. There is a further bunk cabin providing two single berths. A second guest bathroom is situated to starboard and there is a workshop and separate engine room aft. The spacious saloon on this Laurent Giles 55 provide seating for 6/8 guests and an extendable dining table. A smaller seating area also includes a removable table. There is a navigation station with chart table, seat and access to master switch panel and navigation equipment. The galley is equipped with Corian work surfaces, ample drawers and cupboards, twin stainless steel inset sinks, Force 10 three-burner cooker with oven and grill, and shelving storage. Fridge is situated opposite galley under the nav station.